Spleen cryosections (5 µm) from mice expressing CX3CR1-green fluorescent protein (pseudo-colored green) and CCR2-red fluorescent protein (pseudo-colored red) were fixed with BD Cytofix™ Fixation Buffer (Cat. No. 554655), blocked with 5% Goat serum and 1% BSA diluted in 1x PBS, and stained with BD Horizon™ BV421 Rat Anti-Mouse CD4 (Cat. No. 562891) (pseudo-colored magenta), Alexa Fluor® 647 Rat Anti-Mouse CD45R/B220 (Cat No. 557683) (pseudo-colored yellow), and BD Horizon™ BV480 Rat Anti-Mouse CD3 Molecular Complex (pseudo-colored cyan). Slides were mounted with ProLong® Gold and the image was captured on a BD Pathway™ 435 Cell Analyzer (epifluorescence microscope) and merged using BD Attovision™ Software. 20X objective. Done in collaboration with the Catherine Hedrick lab at La Jolla Institute of Allergy and Immunology. Spleen cryosections (5 µm) from wild-type mice were fixed with BD Cytofix™ Fixation Buffer (Cat. No. 554655), blocked with 5% Goat serum and 1% BSA diluted in 1x PBS, and stained with BD Horizon™ BV421 Rat Anti-Mouse F4/80 (Cat. No. 565411) (pseudo-colored red), BD Horizon™ BV480 Rat Anti-Mouse CD3 Molecular Complex (Cat. No. 565642) (pseudo-colored cyan), Alexa Fluor® 488 Rat Anti-Mouse B220 (Cat. No. 557669) (pseudo-colored green), Alexa Fluor® 555 Mouse Anti-Human Ki-67 (Cat. No. 558617) (pseudo-colored Yellow). Slides were nuclear counterstained with DRAQ5™ (Cat. No. 564902) (pseudo-colored blue) and mounted with ProLong® Gold. 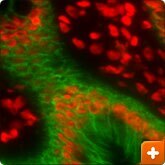 The image was captured on a BD Pathway™ 435 Cell Analyzer (epifluorescence microscope) and merged using BD Attovision™ Software. 20X objective. MCF-7 cells (ATCC, HTB-22) were fixed with BD Cytofix™ Fixation Buffer (Cat. No. 554655), permeabilized with 0.1% Triton™ X-100 and blocked with 5% goat serum, 1% BSA, 0.5% Triton™ X-100 in 1X PBS. 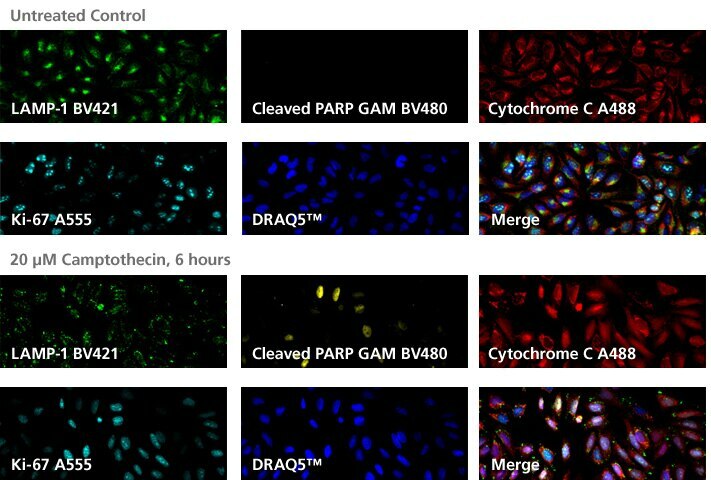 Cells were incubated with Purified Mouse Anti-E-Cadherin (Cat. No. 610182) and the second step reagent was BD Horizon™ BV480 Goat Anti-Mouse (Cat. No. 564877) (pseudo-colored aqua). 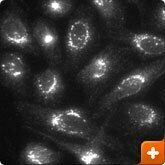 Cells were then stained with directly conjugated antibodies: Alexa Fluor® 488 Mouse anti-β-Tubulin (Cat No. 558605) (pseudo-colored green), Alexa Fluor® 555 Mouse anti-Human Ki-67 (Cat. No. 558617) (pseudo-colored purple), Alexa Fluor® 647 Mouse anti-GM130 (Cat. No. 558712) (pseudo-colored red). DAPI (Cat. No. 564907) was used as a nuclear counter-stain (pseudo-colored blue). Slides were mounted with ProLong® Gold antifade (Life Technologies) and the image was captured on a BD Pathway™ 435 Cell Analyzer and merged using BD Attovision™ Software (BD Biosciences). 20X objective. Cultured cells from the human U-2 OS (Osteosarcoma, ATCC HTB-96) cell line were fixed with BD Cytofix™ Fixation Buffer (Cat. No. 554655), permeabilized with BD Phosflow™ Perm Buffer III (Cat. No. 558050), blocked with 5% Goat serum, 1% BSA, and 0.5% Triton™ X-100 diluted in 1x PBS, and stained with Purified Mouse Cytochrome C antibody (Cat. No. 556432) at 2.5 μg/mL. After washing, the cells were stained with the second step reagent, Goat BD Horizon™ BV480 Anti-Mouse Ig (Cat. No. 564877) (pseudo-colored green) at 2.5 μg/mL. After washing , the cells were then stained with BD Horizon™ BV421 Mouse Anti-Human CD107A (Cat. No. 562623) (pseudo-colored red), Alexa Fluor® 488 Rat Anti-Histone H3 (Cat. No. 558610) (pseudo-colored yellow), and Alexa Fluor® 555 Mouse Anti-Human Ki-67 (Cat No. 558617) (pseudo-colored cyan). DRAQ5 (Cat. No. 564902) was used as a nuclear counterstain (pseudo-colored blue). Slides were mounted with ProLong® Gold and the images were captured on a BD Pathway™ 435 Cell Analyzer (epifluorescence microscope) and merged using BD Attovision™ Software. 40X objective. Cultured cells from the human Hela (Adenocarcinoma, ATCC CCL-2) cell line were fixed with BD Cytofix™ Fixation Buffer (Cat. No. 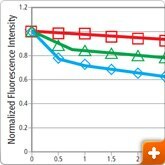 554655), permeabilized with BD Phosflow™ Perm Buffer III (Cat. No. 558050), blocked with 5% Goat serum, 1% BSA, and 0.5% Triton™ X-100 diluted in 1X PBS, and stained with BD HorizonTM BV421 Mouse Anti-Human Lamp1 (Cat. No. 562623) (pseudo-colored green), unlabeled Mouse Anti-Cleaved PARP (Cat. No. 552597) with BD Horizon™ BV480 Goat Anti-Mouse second step (Cat. No. 564877) (pseudo-colored yellow), Alexa Fluor 488 Mouse Anti-Cytochrome C (Cat. No. 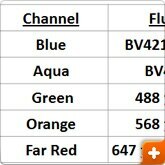 560263) (pseudo-colored red), and Alexa Fluor® 555 Mouse Anti-Human Ki-67 (Cat No. 558617) (pseudo-colored cyan). DRAQ5 (Cat. No. 564902) was used as a nuclear counterstain (pseudo-colored blue). 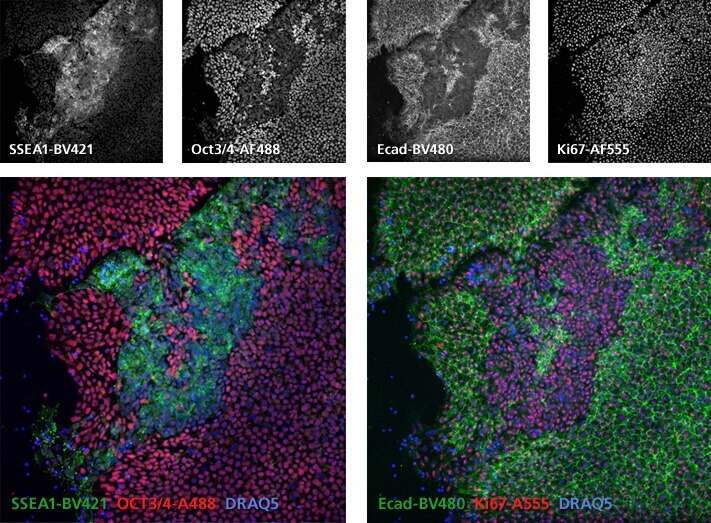 Slides were mounted with ProLong® Gold and the images were captured on a BD Pathway™ 435 Cell Analyzer (epifluorescence microscope) and merged using BD Attovision™ Software. 20X objective. 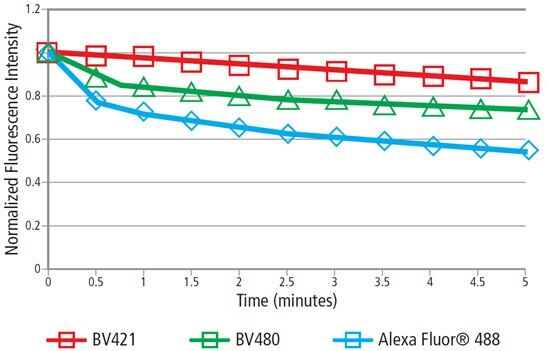 Cultured cells from the H9 human ES cell line were fixed with BD Cytofix™ Fixation Buffer (Cat. No. 554655), permeabilized with 0.1% Triton™ X-100 diluted in 1X PBS, blocked with 5% Goat serum, 1% BSA, and 0.5% Triton™ X-100 diluted in 1X PBS, and stained with BD Horizon™ BV421 Mouse Anti-SSEA-1 (Cat. No. 562705), BD Horizon BV480 Mouse Anti-CD324(E-Cadherin) (Cat. No. 565646), Alexa Fluor® 488 Mouse anti-Oct3/4 (Cat. No. 561628), and Alexa Fluor® 555 Mouse Anti-Human Ki-67 (Cat No. 558617). DRAQ5 (Cat. No. 564902) was used as a nuclear counterstain. Slides were mounted with ProLong® Gold and the images were captured on a BD Pathway™ 435 Cell Analyzer (epifluorescence microscope) and merged using BD Attovision™ Software. 20X objective. 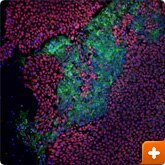 Cells: H9 human embryonic stem cells (WiCell, Madison WI). 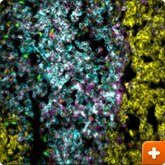 Fix: BD Cytofix™ Fixation Buffer (Cat. No. 554655); Perm: BD Phosflow™ Perm Buffer III (Cat. No. 558050), Block/Stain: 5% goat serum, 1% BSA, 0.5 % Triton™ X-100 in 1X PBS. Antibodies: Purified Mouse anti-Oct3/4a (Cat. No. 561555) with BD Horizon™ BV480 Goat Anti-Mouse (Cat. No. 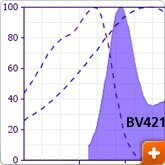 564877), BD Horizon™ BV421 Mouse Anti-Human TRA-1-60 Antigen (Cat. No. 562711). Other reagents: DRAQ5™ (BioStatus), ProLong® Gold antifade (Life Technologies). 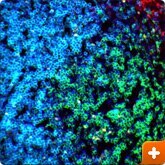 Instrument: BD Pathway™ 435 Cell Analyzer and merged using BD Attovision™ Software (BD Biosciences). 20X objective. 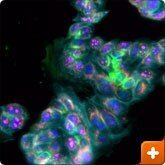 Human breast cancer cell line MCF-7 cells (ATCC, HTB-22) were fixed with BD Cytofix™ Fixation Buffer (Cat. No. 554655), permeabilized with 0.1% Triton™ X-100, and blocked with 5% goat serum, 1% BSA, 0.5% Triton™ X-100 in 1X PBS. 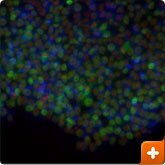 Cells were stained with BD Horizon™ BV480 Mouse Anti-Human GM130. Slides were mounted with ProLong® Gold antifade (Life Technologies) and the image was captured on a BD Pathway™ 435 Cell Analyzer and merged using BD Attovision™ Software (BD Biosciences). 20X objective. 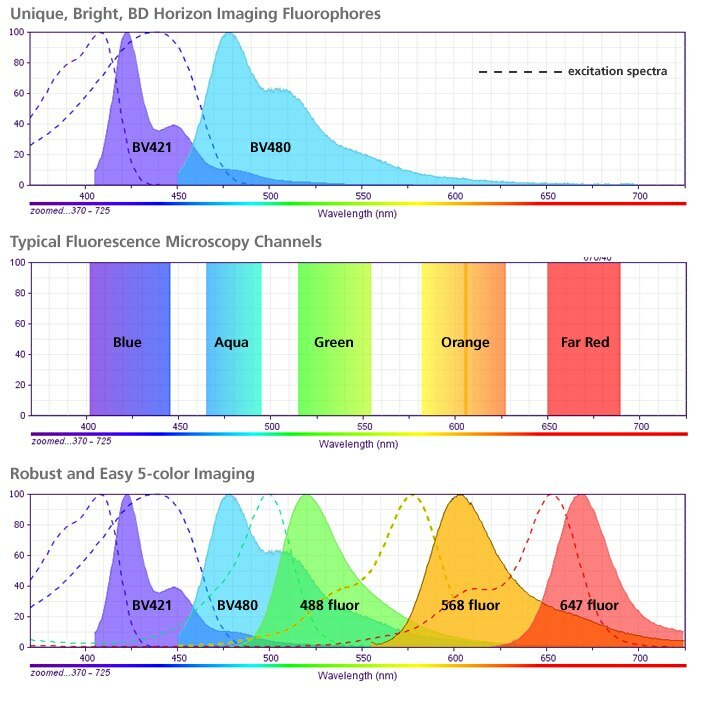 Continuous exposure to excitation light. 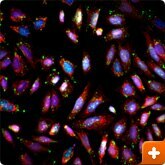 Cells: MCF7 cells. Fixation: BD Cytofix™ Fixation Buffer (Cat. No. 554655) Antibodies: Purified Mouse anti-Human CD324 (Cat No. 562869) with BD Horizon™ BV480 Goat anti-Mouse (Cat. No.564877), BD Horizon™ BV421 Goat-anti-Mouse (Cat. No. 563846), or Alexa Fluor® 488 Goat anti-Mouse (Life Technologies) Other reagents: ProLong® Gold antifade (Life Technologies) Instrument: ImageXpress® Micro XLS (Molecular Devices). 20X objective. Frozen human colon sections were fixed with BD Cytofix™ Fixation Buffer (Cat. No. 554655), permeablized with 0.25% Triton™ X-100, blocked in 5% goat serum, 1% BSA, 0.2% gelatin, 0.2% Triton X in PBS, and stained with Purified Mouse Anti-E-Cadherin (Cat. No. 610182). The second step reagent was BD Horizon™ BV480 Goat Anti-Mouse (Cat. No. 564877) or Alexa Fluor® 488 Goat Anti-Mouse (Life Technologies) (both pseudo-colored green) and nuclei were counter-stained with DRAQ5™ (BioStatus) (pseudo-colored red). Slides were mounted with ProLong® Gold antifade (Life Technologies) and the image was captured on a BD Pathway™ 435 Cell Analyzer and merged using BD Attovision™ Software (BD Biosciences). 20X objective. Alexa Fluor® and ProLong® are registered trademarks of Life Technologies Corporation. Triton is a trademark of Sigma-Aldrich. ImageXpress is a registered trademark of Molecular Devices.